my “all that glitters” class is ready!!! Layers…I LOVE them! and the chunkier the better 🙂 So I have created a class using big textural layers! And of course I added some lovely shiny gold and copper leaf to each piece – because why not! So this new class is all about layers and lustre! We will use lovely chunky layering techniques employing a variety of media, fabric, vintage paper, paint, texture paste, joint compound, and then draw on, and embellish our piece with graphite and gold or copper leaf. To celebrate I am giving away two (yes 2!) free spots in this class. I will draw the winners by random number generator in 3 days time (Monday 10th July in Australian time). Beautiful. I’d love to win this and learn from your class. Thank you. This is the first time I’ve seen your work and I LOVE it. I have always wanted to try making mixed media art. I even bought a canvas awhile back and that is as far as I’ve gotten. I’m thinking that I should just purchase your class and jump in! I’m so glad I saw your Facebook post. Love! Love! Love! I’ve done one lesson by you (Brandi Dayton’s A thing called love” and I LOVE your work! I’ve been wanting to take one of your classes but time & $ have held me back… but a chance for a free class? Yes! But I’m pretty sure I’ll also end up purchasing a couple classes down the road! Wow!! Thanks for the giveaway! would be great to win this fabulous prize! Your work and this class look amazing. So glad I found you! Wow – what a great class just for me ;-)) I love adding dimensions and metallic foil. Looking forward to all your tips and tricks. I now have taken several of you classes and always learned something wonderful new. I love textural art… so much dun and inspiration! All that sparkles is not gold, so true. But anything that glitters is beautiful. I am a huge fan of your stunning work and would be thrilled to win a spot. Even if I dont win I’m doing your classes the moment I can afford to. Your work is magical. Wow you are amazing artist, would love to learn from you. Thank you for your continued inspirations and a chance to win. Now maybe I’ll know what to do with that gold leaf that I’ve had for years. thanks for the chance to win such a great art class… i love the whole look of it! I love your preview video. Please enter my name for a chance to win a spot. I love chunky texture layers. I love gold. I love copper. So I would really really love to win this class! This looks fantastic Toni, love those chunky textures and layers. Hi Toni. I love the textures you have created. I really want to learn this but am not much good at drawing. Is this an advanced class? I have shared as this looks like a beautiful and fulfilling class to do! I am now waiting if Toni will add some male charaters some day. Stunning work! I certainly want to learn! thanks for a chance to win!!!! Oh my, these are beautiful I will be purchasing even if I don’t win. Thank you Toni! Wow! I would love to learn how to make layers like that! Amazing! I love your art and am excited about using gold-leaf! Thanks for the chance to win this class. Would love a lesson on gold leaf! Not to mention all the other gorgeous layers! The simplicity of the faces and the beauty of the gold go so sweet together. Beautiful artwork! Would love to learn your techniques! Oh my goodness… I hope I win. I love your style. Love your work and this one looks fabulous! Would love to win a spot. All the classes I have taken of yours have been so great -inspiring! Thanks for the chance to win! YAY !!!! Oh my gosh, this looks SO fun. Layers and layers of beautiful textured goodness…. I’m IN !!! What a treasure it would be to win a class and spread your golden BLING halfway around the world to Atlanta. Crossing my fingers. The gold is so textural. Is it goldleaf? I can’t wait to see 🙂 Beautiful. Such lovely, soft layers. What a beautiful class. Thank you for a chance to win a spot in your class. Luscious layers and sparkly gold and copper! Yum! What fun it would be to get lost in creating all those glittering layers! I could use more angels in my life. I would love to win! This would be a great project to teach at my camp. I have also left a comment on your Facebook page! What an exciting class. A girl can never have enough bling around her, and to incorporate your creative style in the midst is stunning. I would love to take a class like this! I struggle with layering and texture. Thank you for the opportunity! I’ve wanted to try gold leaf for ages but didn’t know where to start. This class looks awesome! love this style and would love to win a spot! I am sold at anything that sparkles!! Really looks like a fun class!! OMG I would so love to win this as I am in love with this technique. Hey Toni! Just saw your announcement about your new “GLITTER CLASS” and said yipeeeeeee. I just adore your style and artistic manner. I have taken a few of your classes and have loved everyone. Please add me to the l o n g list of entries for a free spot in this class. Thanks again. Yay!! Can’t wait! Beautiful as always. Would love to win. Thank you for the opportunity to win. Sparkle and shine with great combinations of textures! Would love to learn your techniques! Looks like my kind of class, layers make everything better in art! Thanks for a chance to win a spot in this class. As always Toni this looks amazing!!! Thanks for the chance to win!! Looks awesome!…thanks for the chance to win! I have all your classes and this looks to be another marvelous one!!! Thanks for the opportunity to win a spot! Love your work! This class looks amazing and so appreciate the opportunity to win a spot. Will happily share on facebook. Wow! Love it! The gold leaves just makes it extra special. I have always wondered how to add gold leave to my work. Your art is beautiful! I’m very interested in learning more from you, and winning a spot in your class would be amazing. Thanks for doing this giveaway. So, pretty! Would love a chance to win. Thanks! So beautiful! Would love to win 🙂 ! You are an amazing artist. I would love to win one of your classes! so beautiful I would love to win! Love the texture and gold leaf! 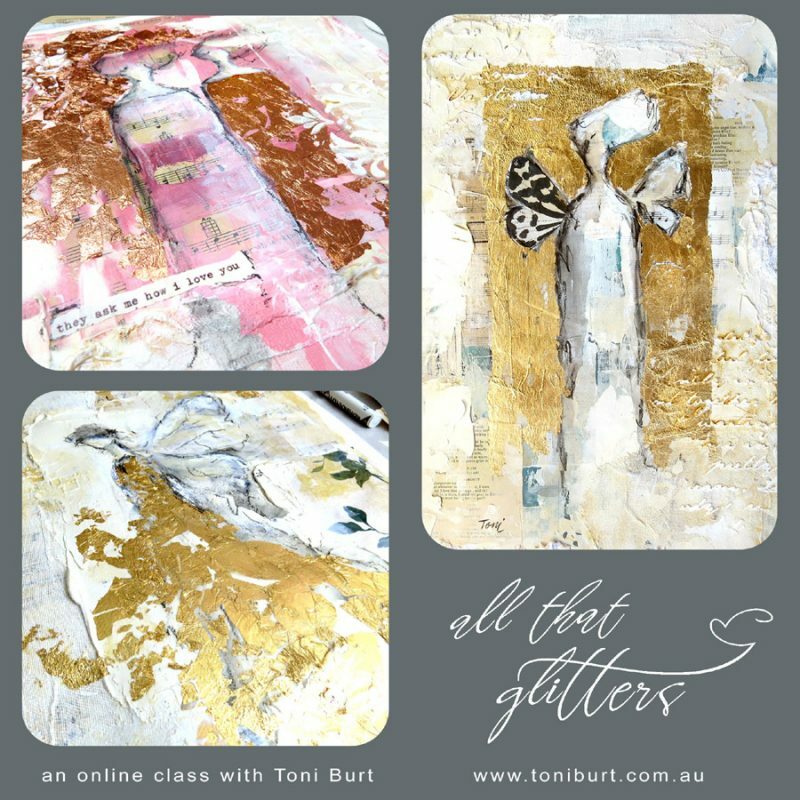 Toni Burt you are absolutely one of my favorite mixed media artist. Would love to win a spot in this class. Ohh I really want to win! This looks gorgeous! Another beautiful class Toni – and a generous giveaway. Sounds like a great class! Your work is beautiful. I’m intrigued by the gold and copper leaf as I’ve never used that before. I was just looking at your courses last night. I was trying to decide which one I wanted to try. Now I’ll have another to choose from. I guess I’ll just have to try them all…one class at a time. Thanks, Toni! I love your work. I love the colours and all the layers you use. It would be amazing to win a free spot. Whay amazing artwork. Thanks for the chance too win. I love the leafing addition…. Your new class looks fabulous Toni! Thanks for giving us the opportunity to win a spot – it would be so cool to win that gift. I love your wonderful work and I love sparkles…a lot 🙂 and now you make a beautiful combination of them! Beautiful girls Toni, I would love to do this class and learn some some of your layering techniques!! Thank you ! pick me please . These pieces are so beautiful, and it would be wonderful to win the opportunity to participate. Love your work, have tried a couple from your free videos and they were fun to do. I am so excited about this class. I am hoping my good vibes sent arrive at the random drawing just in time to see that my name pops out of your sweet little hands. Oh beautiful mixed media. I would love to do a bit more learning in this field did a day class but want to develop my own style. Love yours. Oh my goodness! These pieces are beautiful! This would make me very happy and grateful!! This is very generous and I hope I win! Sharing on my FB page thanks! You never cease to amaze ! Love, love, love your work Toni!!! I love learning new ways of doing art . Thank you for a chance to win !! Oh my goodness I would love love to win this!!! Fingers crossed I can get one of the giveaways, you know I love your style and now this new gold they look just amazing !!! Happily shared!💖💖💖. This looks li,e an amazing class. Love how you are spreading your wings and letting the sun shine on them making them glow gold! Your work is SUPER AMAZING!!! I always just stare at it in wonder!! Now kimhojust maybe I have chance to win a free spot in your class. Oh gosh how very generous!! Thank you for sharing your work with us for I believe by observing and challenging ourselves to try, we grow ourselves as well on so many levels – not just as an artist. Your work is SUPER AMAZING!!! I always just stare at it in wonder!! Now just maybe I have chance to win a free spot in your class. Oh gosh how very generous!! Thank you for sharing your work with us for I believe by observing and challenging ourselves to try, we grow ourselves as well on so many levels – not just as an artist. This would be great for the beginner that I am!! Have only just found you thanks to my new friend. Love your work Toni! Hopefully I will be one of the lucky winners. I LOVE all your artwork! Especially the girls! The goldleaf class looks like it would be different and lot of fun! So nice of you to give away 2 spots in the class! I Love your work Toni. Would be awesome to win a spot in your latest class!! How amazing! Thanks so much for this amazing opportunity! Love your art work!! Would be great to win a spot in the class. Thank you for the chance! This class looks wonderful. I recently purchased some gold leaf but had no idea what to do with it. Now I do! Beautiful. Oh my goodness~this is the coolest thing you’ve done! LoVe~LoVe~LoVe this! Toni this is so sweet of you give away two spots in your new class. I would love to win this class I think it would go so well on the journals I’ve made from your classes. I’m excited either way to try this awesome looking new class. You always come up with such beautiful and different artwork and I love it all! I said that if it sparkles then it is for me. I am signing up right now.